What’s with the tire failures at Tour of Oman? I’d guess plenty of racers have ridden plenty of races under very hot conditions, perhaps even being forced to ride their brakes behind a “safety car” on a long descent. But this is the first time I’ve ever read about (or watched video) of tires popping like rifle shots. Neither back-in-the-day of aluminum rims and not even more recently with the popularity of carbon rims have I seen or heard about this. Carbon clinchers have had their share of failures as you guys have noted in the past, but tubulars? I’m wondering if the carbon wheels simply don’t push off the braking heat as well as aluminum, which everyone pretty much admits by requiring the use of special high-temperature brake pads. Tire glue melts under the intense heat of Oman + riding the brakes on a long descent = tires moving on the rim, possibly tearing out the valve stem? Or maybe simply heating the metal valve stem to a temperature that causes it to melt the butyl or latex of the tube? I’ve heard tales of both of these scenarios happening with aluminum rims, though I have never seen it in person or talked to someone who had. It’s always been third-hand stories, which made me wonder about their authenticity. It would be interesting to hear what the makers of these products have to say about this rather dramatic series of failures as well as what other theories are out there that might explain them. I believe it’s the former of your theories, not the latter. What is without dispute is that Saturday’s 151-kilometer fifth stage of the Tour of Oman was canceled after riders concerned for their own safety staged a sit-in. The magnitude of the temperature is certainly critical, as pro riders and most readers are probably familiar with descending at 100 degrees Fahrenheit, but not so much at 120 degrees Fahrenheit! Probably most of us either wouldn’t be out riding up and down steep mountains at such a temperature, and, if we were, the heat alone might cause us to be conservative on the descent, a luxury that riders at the front of a race seldom have. The question is, why did the tires blow, and why did only one team — Bardiani-CSF — seem to bear the brunt of the problems? 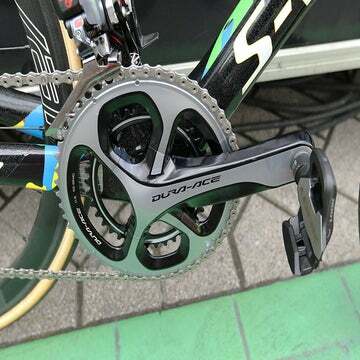 And whether it was only Bardiani also seems to be uncertain. Movistar Team Director Sportif at the race Chente García Acosta explained, “On that descent, due to extreme heat — 38º, 40ºC — the downhill and the hairpin turns, we all started to puncture en masse. We counted 11 punctures from our team only in that descent.” But Mauro Gianetti, who was on the ground in Oman working with the Lampre-Merida team, said the failures were limited to Bardiani-CSF. The prolonged braking required during a neutralized descent (riders had to stay behind the lead vehicle) played a crucial role, since shorter braking and releasing creates less heat buildup in the rim and tire than does prolonged braking. And clinchers, especially on carbon rims, can blow off of their rims due to heat, too. I think it’s fairly clear that the wheel with the unseated tubular tire the Katusha rider showed in the video was probably neither a wheel of Bardiani-CSF nor of Katusha. The top UCI WorldTeams using Fulcrum wheels are Lampre-Merida and Ag2r La Mondiale. Bardiani-CSF’s tire sponsor is CST, which offers no tubulars. Since teams generally race on tubulars, chances are still good that the blown tires were tubulars, although the Deda Elementi-labeled wheel visible in this photo could be a tubular or a clincher, as the WD45CTU tubular wheel and the WD45CCL clincher wheel look very similar. Furthermore, they might not even be Deda Elementi wheels, since teams often race on other wheels relabeled to look like their sponsor’s wheels, just as they often do with tires. It is possible that the Bardiani-CSF riders who blew tires were using clinchers, which can increase the likelihood of this problem over tubulars for three reasons. One is that carbon clincher wheels can fold outward and release the tire when subjected to enough heat to soften the resin in the wheel’s carbon matrix, combined with enough pressure in the tire to push the carbon rim walls outward. Different wheel brands use different resins with different Glass Transition Temperature (Tg), the temperature region in which a non-crystalline material (like the hardened resin in a carbon matrix) transitions from a hard, glassy material to a soft, rubbery material; different wheels thus differ in their resistance to this happening. Bardiani was, according to Gianetti, riding Deda carbon clincher wheels with CST clincher tires. Gianetti said the problem was not the clincher tires blowing off the rims but the sidewalls of the rims blowing out due to the high pressure build up in the tires. The other reason that a clincher can be more likely to blow in the heat is that high-quality tubulars generally can hold more pressure than clinchers, because the casings are extremely strong and are sewn together, rather than depending on being anchored in the rim to prevent an explosion. Finally, a clincher can fail with heat without either the rim or the casing failing if the melting temperature of the inner tube is exceeded (see Josh Poertner’s comments below). While different wheel and brake pad combinations may retain more heat than others, the explanation must come down to differences in glue between teams (if the failed tires were tubulars), since tire quality, pressure, rider weight, and braking technique all are likely to be very similar. If the casing doesn’t rip, the air can’t explode out unless the valve stem gets torn out, since air from an otherwise failed tube would tend to bleed out, rather than make a loud pop. And as Specialized chief tire engineer Wolf Vorm Walde said, “If it gets so hot that brake heat isn’t dissipating, I’d expect the rim cement to go before the latex tubes melt.” So that answers your second theory, Larry. “At Zipp we built a machine we called the ‘Chariot of Fire’ to try and understand all of this during our carbon clincher development, and it used a 400-lb. 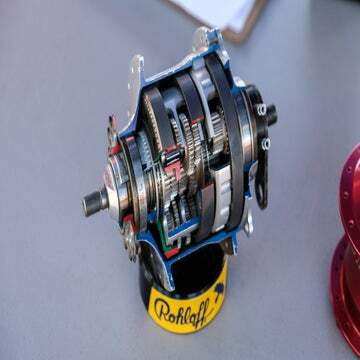 flywheel driven by an electric motor and could simulate most any type of downhill situation, different rider mass, and could even be programmed with real-world descending situations. It could also simulate environmental conditions like heat, cold, or rain. We found that the worst thing you can do during descending is prolonged, constant braking; the rim never has time to cool so the temperatures continue increasing at some pretty unbelievable rates. Even giving the wheel 2-3 seconds of rest during a test could drop temperature by almost 100 degrees F.
“The issue with tubulars is that once the glue reaches a point where it is sufficiently softened around the perimeter of the rim or the rim is hot enough around the entire circumference to keep the heat in the glue line, the tire will slide in the rim bed due to the braking forces and rip out the valve stem. This is most certainly what was happening here. The video with the audible punctures shows how consistent the effect is when you figure that riders with very similar body weights, on the same descent on the same equipment, are all flatting within meters of each other. These aren’t tires rolling off of rims; rather, they are rotating on the circumference. “The core problem with the carbon wheels (and it’s important to remember that this was a problem with aluminum rims back in the day) is that you need some heat for good braking, but too much heat causes other issues. And at 48 C ambient, Newton’s law of cooling is really working against you in the overheating department. You have very little heat transfer within the rim/glue/tire system to begin with, and when ambient temperatures are so high, you have even less transfer to the environment, plus the system temperature is already elevated before you even begin braking … all bad. “I see in the comments section people advocating clinchers, but it’s important to note that they aren’t immune to this either, as the temperatures of the rim can reach the melting point of the inner tube (~250 F for latex and ~340 F for butyl), resulting in a tube failure due purely to heat, and that’s assuming you have a carbon clincher rim that hasn’t surpassed its Tg before that. “This could largely be mitigated with brake pad selection based on temperature and conditions. From an industry perspective, this is a big issue, as half of the industry likely doesn’t fully understand the problem, and the other half feels that it would put their products in a negative light to suggest that you couldn’t have one brake pad as the be-all/end-all pad. But for cold and especially cold/wet weather, you need pads that generate some heat to get good initial bite and good overall stopping power, but in extremely hot weather you need the opposite. Companies like SwissStop are doing a great job of pushing the boundaries ever wider so that one pad can handle ever broader conditions, but at the extremes, you would be better off with pads designed for those conditions. Temperatures like those encountered in Oman are not going away. 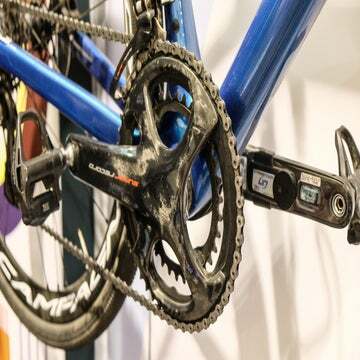 Bike racing, like all cycling, will encounter more extreme weather, and cycling equipment will continue to evolve to adapt to it. Occurrences like this may become ones where both consumers and manufacturers more broadly recognize the problems and take steps to address them. It is hard to predict all of the scenarios that might happen in cycling with more extreme weather, but blown tires like in Oman, softening asphalt like in the famous Tour de France Beloki broken hip/Armstrong cyclocross shortcut, and the brutal snowstorm of the 2013 Milano-Sanremo come to mind. Equipment, clothing, and race rules are among the things destined to change as a result. Certainly, disc brakes would make the rim-heating problem a non-issue, but I don’t think we are yet at the day where little lightweight road disc brakes with tiny rotors have sufficient heat capacity to not boil the fluid on 120-degree days, particularly under heavy riders who brake in a prolonged way. I don’t think anybody wins the argument of which is preferable — blowing a tire or having total brake failure! For a few hours last Tuesday, I posted a response saying that Shimano 11-speed road shifters are compatible with Shimano 10-speed road shifters. This is incorrect, and it is why we pulled that question and answer down after only a brief period. Just as it did on mountain bikes when going from 9-speed shifters and derailleurs to Dynasis 10-speed and 11-speed systems, when Shimano went from 10-speed to 11-speed road shifting systems, it changed the cable pull to provide more adjustability and durability of adjustment with the narrower cog spacing.